I love quirky jewellery especially when they are one of a kind. Every now and then expressing myself by wearing something unique or adding an element of surprise. From outfits like glittery jazzy shoes to jewellery pieces which are just so different does keep your style distinctive from others. It lets you express your thoughts and being different from the rest of the world. I recently purchased a set of earrings which are so unique yet stylish. 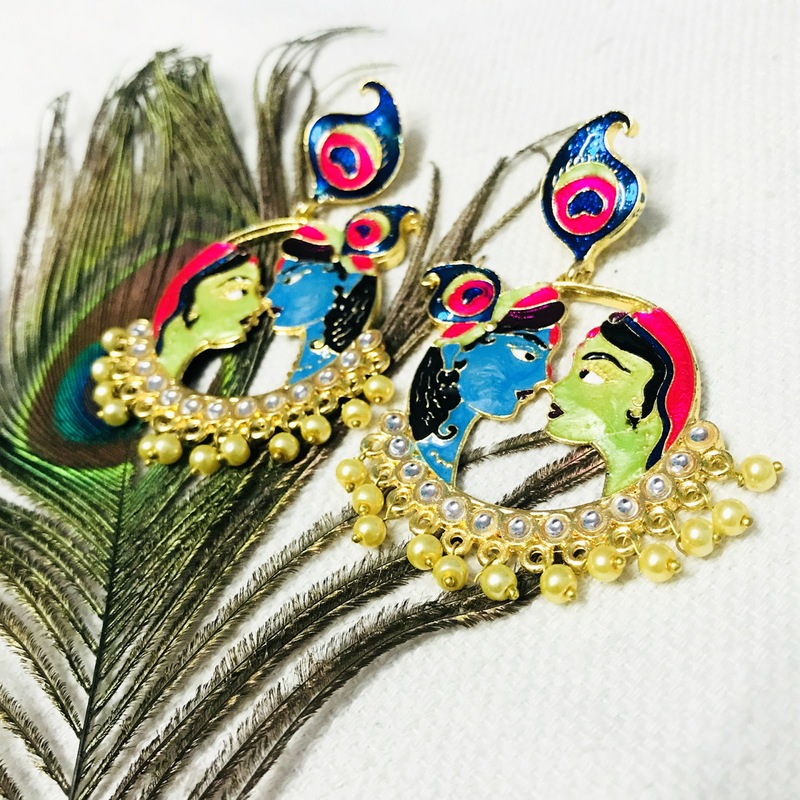 Rutvi earrings from PreciousYou are inspired by the eternal love between Lord Krishna and Radha, depicting an image of both crafted in metal and coloured with enamel. 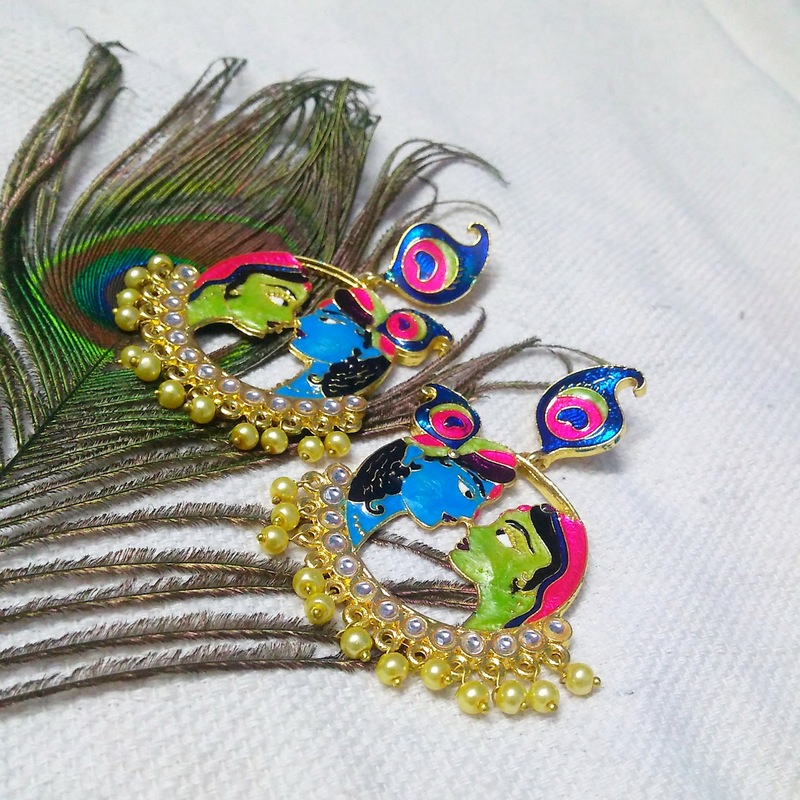 The beauty of these earrings is accentuated with meenakari by expert artisans. It has a delicate embellishment done with kundan beads and pearls at the bottom. Very bright and bold, these earrings stand out due to their extraordinary design. You don't find this kind of design on streets easily. 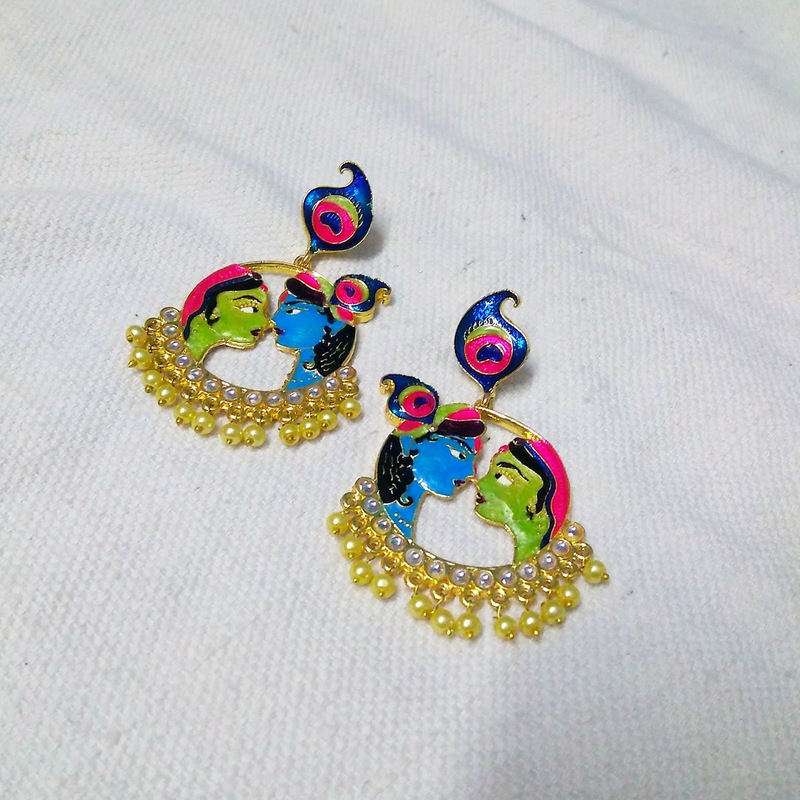 These earrings are best worn with a palazzo kurta set but you can also rock them with an embroidered tunic or top and a pair of jeans adding that bit of jazz to the look. 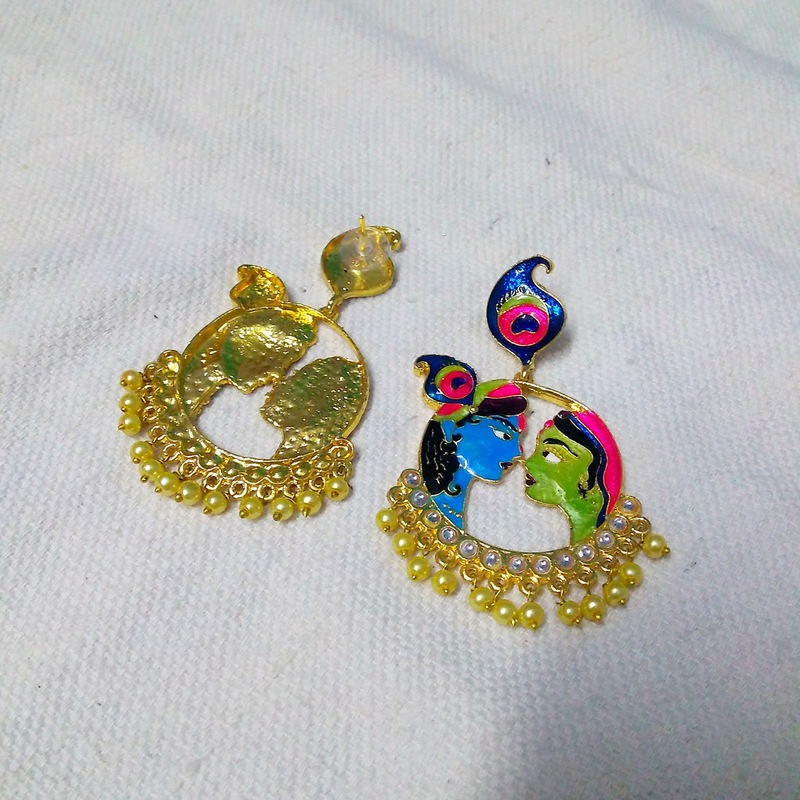 The cost of these earrings was Rs 1300 but since there is a discount on the website, you can buy them just for Rs. 999. Delivery was also very quick. Once ordered, these earrings were at my doorstep within 2 days which was really good. These earrings are quite sturdy and heavy which speaks about their quality. Although you might need to store them carefully to prevent any discolouration due to oxidisation. Wrap them up in a tissue paper or clean cotton cloth nicely and pack it in an airtight jar. PreciousYou sources all the fashion accessories from the origins to ensure that the surprise factor and hard work shows without making the accessory super expensive. The brand believes in putting together a collection containing some of the exquisite pieces of fashion jewellery, something you love to flaunt. Be it a stunning pair of embellished earrings from Afghanistan, a traditional handcrafted necklace from Nepal or a fabulous piece of jewellery all the way from Kazakhstan- you name it and you have it! A treasure trove for jewellery aficionados, PreciousYou collection comprises authentic handmade pieces directly sourced from their place of origin that have a unique story to tell. If you also love to wear quirky one of a kind accessory, you need to visit this place. If you have purchased anything from PreciousYou, do tell me about your experience in the comments below.